How should I select a Heating, Ventilation and Air Conditioning Contractor? Always ask for references. Pay special attention to a contractor’s ability to diagnose and solve service and installation problems. Technicians should be professional and courteous, come prepared, and arrive on time. The company should be licensed and bonded. For your convenience and to provide you with more direct access to management, your service company should be locally owned and operated. It is advisable to have your system checked once in the Fall to check your heating system and initiate the humidifier. Similarly, you should service your cooling system and shut down your humidifier in the Spring. What are the advantages of Planned Maintenance Service Agreements? Planned Maintenance helps identify failing parts prior to failure. This will minimize the possibilities of equipment failure. In addition, it may minimize more costly repairs due to failure of a less expensive component. Well-tuned heating and cooling systems will maximize the efficiency of the equipment. What should a homeowner look for to determine if their HVAC system is functioning properly? If you are not able to reach a set temperature, your system may not be functioning properly. Please contact a heating and cooling specialist who can assist you with a unit that is not functioning properly. What forms of payment does Argent accept? Do you have a question that is not listed above? 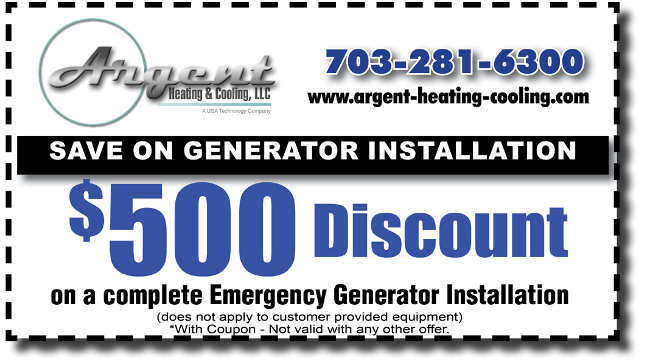 Ask the experts at Argent Heating & Cooling about your indoor comfort! If you have questions on any of our products or services, please call us at (703) 281-6300 to speak to a representative! Alternatively, you can use our online contact form and one of our Heating and Cooling Experts will get back to you within 24 hours. Although you can trust the experts at Argent Heating & Cooling to know the ins and outs of your heating and cooling system, knowing the following terms can help you better understand your own system and know when it’s time to call in a professional. Advanced Reciprocating Compressor– Type of compressor that uses a more efficient process for compressing refrigerant for better cooling efficiency. AFUE– Annual Fuel Utilization Efficiency. Indicated as a percentage, your furnace’s AFUE tells you how much energy is being converted to heat. For example, an AFUE of 90 means that 90% of the fuel is being used to warm you home, while the other 10% escapes as exhaust with the combustion gases. BTU– British Thermal Unit. Used for both heating and cooling, BTU is a measure of the heat given off when fuel is combusted. One BTU is equal to the heat given off by a wooden kitchen match. Capacity– The ability of a heating or cooling system to heat or cool a given amount of space. For heating, this is usually expressed in BTU’s. For cooling, it is usually given in tons. Compressor– Part of a split system heat pump or air conditioner’s outdoor unit that controls the pressure applied to the refrigerant, necessary for taking in heat to warm your home or getting rid of heat to keep your home cool. Condenser Coil– Part of a split-system air conditioner or heat pump. By converting refrigerant that is in a gas form back to a liquid, the coil sends heat carried by the refrigerant to the outside. Damper– A type of “valve” used in ductwork that opens or closes to control airflow. Used in zoning to control the amount of warm or cold air entering certain areas of your home. Downflow– A type of furnace that takes cool air from the top and blows warm air to the bottom – common when your furnace must be located in a second-floor closet or utility area. Electronic Air Cleaner (EAC)– An electronic device that filters out large particles and contaminants in indoor air. It then electronically pulls out tiny particles that have been magnetized, such as viruses and bacteria, drawing them to a collector plate. Evaporator Coil– Part of a split system air conditioner or heat pump located indoors. The evaporator coil cools and dehumidifies the air by converting liquid refrigerant into a gas, which absorbs the heat from the air. The warmest refrigerant is then carried through a tube to the outdoor unit (condenser coil). Fan Coil– An indoor component of a heat pump system, used in place of a furnace, to provide additional heating on cold days when the heat pump does not provide adequate heating. HSPF– The Heating Seasonal Performance Factor is a measure of the heating efficiency of a heat pump. The higher the HSPF number, the more efficiently the heat pump heats your home. Horizontal Flow– A type of furnace, installed on its “side,” that draws in air from one side, heats it and sends the warm air out the other side. Most often used for installations in attics or crawl spaces. Humidifier– A piece of equipment that adds water vapor to heated air as it moves out of the furnace. This adds necessary moisture to protect your furnishings and reduce static electricity. Load Estimate– A series of studies performed to determine the heating or cooling requirements of your home. An energy load analysis uses information such as the square footage of your home, window and door areas, insulation quality and local climate to determine the heating and cooling capacity needed by your furnace, heat pump or air conditioner. Matched System– A heating and cooling system comprised of products that have been certified to perform at promised comfort and efficiency levels when used together, and used according to design and engineering specifications. Operating Cost– The day-to-day cost of running your home comfort equipment, based on energy use. Payback Analysis– Overall measure of the efficiency and value of your home comfort system. By combining your purchase price and ongoing operating costs, a payback analysis determines the number of years required before monthly energy savings offset the purchase price. Reclaiming– Returning used refrigerant to the manufacturer for disposal or reuse. Reciprocating Compressor– A type of compressor used in air conditioners that compress refrigerant by using a type of “piston” action. Recycling– Removing, cleaning and reusing refrigerant. SEER– The Seasonal Energy Efficiency Ratio is a measure of the cooling efficiency of your air conditioner or heat pump. The higher the SEER number, the more efficient the system is at converting electricity into cooling power. Scroll Compressor– A specially designed compressor that works in a circular motion versus an up and down piston action. Setback Thermostat– A state-of-the-art electronic thermostat with a built-in memory that can be programmed for different temperature settings at different times of the day. Split System– Refers to an air conditioner or heat pump that has components in two locations. Usually, one part of the system is located inside (evaporator coil) and the other is located outside your home (condenser coil). Thermostat– Unit that monitors and controls your HVAC system products. Ton– A unit of measure for cooling capacity. One ton=12,000 BTUs per hour. Upflow– A type of furnace that draws cool air from the bottom and blows the warmed air out the top into the duct work. This type of furnace is usually installed in a basement or an out-of-the-way closet. Ventilator– A ventilator captures heating or cooling energy from stale indoor air and transfers it to fresh incoming air. Zoning– A way to increase your home comfort and energy efficiency by controlling when and where heating and cooling occurs in a home. Programmable thermostats are used to control operating times of the equipment. Dampers are used to direct airflow to certain parts or “zones” of the home.